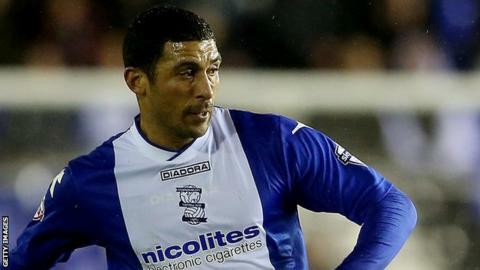 Birmingham City have recalled utility man Hayden Mullins from his loan spell with League One side Notts County. The 35-year-old will go straight back into Lee Clark's squad after on-loan defender Tom Thorpe was injured during Saturday's defeat by Leeds United. Birmingham are in the Championship relegation zone with two matches to go, the first of which is their game in hand against Wigan Athletic on Tuesday. Mullins has played 37 times for Blues since his move to St Andrews in 2012. The former West Ham player scored one goal in 16 appearances for Notts County, whom he joined on loan on deadline day in January. The Magpies have relegation concerns of their own, lying just two points above the relegation zone with one match remaining. Thorpe, 21, recently re-signed for the Blues on an emergency loan but has now returned to his parent club Manchester United to undergo treatment, having suffered a recurrence of the ankle injury that prematurely ended his first loan spell at St Andrew's. Birmingham, who have conceded 24 goals in their past eight home matches, will be without suspended captain Paul Robinson against Wigan, while fellow defender Will Packwood is a doubt.